Good news came my way from the Seattle gallery owner yesterday afternoon. She sold a couple more small panel paintings. Nice way for me to end the year although I suppose it will be in 2008 sales accounting due to the timing. Other good news is that I think I have the 40 x 70″ Collioure 4 painting now finished. At least I think it is….what do y’all think? I took the picture about noon to send to the Austin gallery owner. If the client they are working with will get all their stuff together it will be a good beginning to the year for me with two large 40 x 70’s to ship/deliver as a commission. IF NOT, no wasted time as I can send these to another gallery. Although I must admit I did get bogged down a little with doing commissions and not finishing up some other work. Oh well…nothing lost, as I will now set that work up on the easel wall and get back to it. …three diptychs…or if they just won’t reconcile to my satisfaction, then there may be six separate paintings. I won’t lock myself into having to finish them as I started them since some time has passed. With galleries now in Dallas, Seattle, Chicago and Long Grove, IL, Pinetop/Lakeside,AZ, Baton Rouge and Covington, Louisiana………along with doing some work for some design firms, I’ve got my work cut out for me in 2008. It should do a lot for my work ethic. This list is looking very familiar…kinda like the one for 2007……..SO, of course, there will be some things I might not be planning for 2008 due to the success in some areas in 2007. Everyone will have different goals and mine are somewhat changeable, whether planned or not. This is a little too linear for me. I’m about the same way planning paintings and career moves. I want a loose plan but also will veer off line at times when chance merits the diversion. Now it’s time to look forward. It’s the time when pressure stampedes at you from all directions to set goals. Set goals, make a plan, and clarify your vision. This works for some people, but is too linear or restrictive for others. This year, try planning your wins instead. Take that list I gave you last week (also available as a podcast on the Art Biz Blog) and turn it around to plan ahead for your 2008 wins. You don’t want to leave your success to chance. 1. How will you promote your art consistently? I want to continue to work with the galleries I have now. I will be working with a museum for a 50th anniversary show in 2008 which will actually promote local area artists. 2. What new ideas or tools will you try? This isn’t really new but when I make trips I usually come up with some new outlook for my paintings. It just develops without me thinking about it a lot. 3. What will you do to amplify your online presence? I’ll continue blogging and keeping my website up. I do all the work there myself. 4. What technological skills do you need to learn or improve? Keep on learning more with the programs I have. 5. How many people would you like to add to your mailing list? I don’t add a lot since galleries don’t usually share their sales names and addresses. This is my main sales base. I will add people and galleries as I know them. 6. What cool or influential people in your community would you like to meet? I go to art openings fairly regularly so hopefully there will be a continuing growth in the area of meeting new people. Psst…I already know the coolest, of course. 7. What printed marketing piece do you need to create or revamp? None in the works for now. 8. What medium or skill will you attempt or master? I will just continue to work with my acrylic and mixed media pieces…as well as the encaustic wax. Master??? I guess there aren’t enough years for that but you can keep trying. 9. What will you try that is completely new? 10. What have you been procrastinating because it’s uncomfortable, but you know it will be good for you? Maybe this is the year to “donate” a class to the museum. It will help me get over my fear of teaching a workshop. 11. What art events, galleries, and museums will you plan to visit? Whatever interesting shows come up and I’m nearby, I hope to attend. It’s possible I will be in DC this year and will really make a dent in some museums there if I do. 12. How will you improve your studio habits? Set a time-table up and adhere to it…no excuses! 14. What seminars/workshops/lectures will you attend? I’m keeping an eye on the listings with Dallas and Fort Worth museums to see what they have coming up for lectures on their exhibits. I, also, attend Mississippi Art Colony twice a year. This year I may have to miss one due to another trip…but maybe not. 15. What organizations will you join or become involved with? I’m involved with more than I can do much for as it is. 16. What grants/honors/awards will you apply for or receive? Getting the application completed is a win in itself. Nothing planned here. I play this by ear every year. 17. What articles would you like to see written about your work? It would be nice if the newspaper would start having more ART articles in the paper again…I can wish anyway but we do have a new publisher coming in, so who knows? 18. What galleries, exhibits, or other venues will you submit your art to? I’m just going to try to furnish the ones I have now with good work…that will take ALL my time. 19. Where can you save a wad of money? You know….I didn’t answer this one correctly in the last post….I DID save a wad of money by purchasing my canvases right here in town. It costs a fortune to ship large pieces so I saved a ton………….my hat’s off to SUNBELT MFG….right here in Longview, TX. And I save by buying my shipping boxes made to order from a local manufacturer, too………….Century Corrugated. All of them are fine folks to work with. I also buy a lot of my acrylic paints from NovaColorPaints.com. Great people and product although I love Golden paints as well. 20. What is the single thing you can do in 2008 that will move your career ahead the fastest? Staying in the studio a lot……….AND, just being reliable and responsible as I generally am about meeting my obligations. 21. And (my own addition)……….FUN, FUN FUN…………I’m going to Umbria/Tuscany Italy for a month. This will be SO great in that it feeds my art and my spirit. I’m just now getting around to writing this but I have been thinking about it some since this came out of Alyson Stanfield’s ArtBizCoach.com newsletter on Dec. 17th. Of course, rarely will a person (even with good intentions and lots of organization) do ALL of this but it’s a good start. Sometimes we think we fall down on our goals and haven’t accomplished enough.We tend to have high expectations for ourselves. We can, also, be our own worst critics. BUT, now and then, maybe we should stop and pat ourselves on the back for what we did accomplish. What better time than the end of a year? 1. How did you promote your art?I did send out a lot of inquiries about new gallery representation. I sent several press releases to my hometown paper (Longview News Journal )….BUT, it seems they no longer print press releases from artists unless they have a solo show within driving distance of Longview. I know it isn’t my writing skills since they used to put them in verbatim. I’m a stickler for following the protocol they set up in the past. My friend and AZ gallery owner, Gwen Pentecost, sent out my show invitations to a lot of these galleries as well. It really paid off for me with a new gallery in Seattle seeing my work. 2. What did you do to enhance your online presence?I updated my website but kept it very simple and without too many changes to confuse regular visitors. I started making blog entries. I know…I’m not too consistent there, but I didn’t start it to market my work…I did it for myself. I just don’t have anything I want to write about every day or no time to do it. 3. What technological skills did you learn or improve? I can’t think of any particular ones…I just keep learning by bits and pieces. 4. How many people did you add to your mailing list? I did go in and make a mailing list just for galleries I would like to see my work over and over through inviations or news items. I added and took people off or updated addresses. I don’t have that many since I never felt I needed too many since I don’t do festivals, etc. 5. Who were the top ten cool or influential people you met? I finally met Gwen Pentecost, my AZ gallery owner in person. SHE IS COOL, for sure, plus a great business person and artist. I didn’t meet the Seattle Gallery owner, Barbara Mack Keith, in person, but I have no doubt that she is one COOL lady as well. And she keeps in contact regularly “by snail mail and hand written notes, too”. I met Elin Pendleton, a great CA artist I knew through Paint-l yahoo groups in Chicago this year. There were so many cool new people there at the Chicago show….like, Richard Schmid, David Becker, good gosh…I forgot all of the names now but all the Hilligoss Galleries folks are really great people. 6. Did you create a new business card, portfolio, or other marketing piece?I had a new card created last year and continue to make up new portfolios as the need arises for every particular presentation. 7. What medium or skill did you attempt or master?Oh wow…………I started working with encaustic wax. I completed a whole small format series.I love it but still keep painting with acrylic on canvas mostly. 8. What did you try that was completely new? See above. 9. What did you try that was uncomfortable, but helped you grow?I had to get up in front of a museum audience and talk about NAWA, and then my own work in particular. In a weak moment, I even told the museum director I might work with her for a small workshop in the future. Let me tell you this does make me feel uncomfortable. But it’s kinda like getting your daily exercise, makes you feel good when it’s over. 10. What new art events, galleries, and museums did you visit?I regularly visit galleries and museums in Dallas at the art walks. I visited the Chicago Art Institute for the first time. For two years I had been working with my local art museum and the National Association of Women Artists for a show here in Longview. It was a great success I think. I went to Chicago for the big invitational show for Women Artists of the West at Hilligoss Galleries. I, also, joined the Modern Museum in Ft. Worth. 11. What resources did you discover?I did extensive research about encaustic wax painting. The RFPaints forum is a fantastic site to learn about the technical issues. From that site you learn about even more places to extend your knowledge of this enticing medium. The International Encaustic Artists are another great group I became a member of recently. 12. How did you improve your studio habits?HUH!!!! (stammer, stammer) Let’s don’t go there, please. This needs to be #1 for 2008 since without it, the rest are nothing. 13. What books did you read to help your career?I’ve read so many in the past that my mind is overflowing. BUT, I’m always on the look out for more information that flows in through the internet or other artists (This is for marketing, etc.) 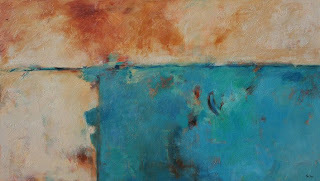 I really enjoyed the Art of Encaustic Painting by Joanne Mattera. I’m still absorbing info from that one and look forward to the new one she is working on. Nita Leland’s New Creative Artist is another one I’m particularly fond of (my work on the cover) and so much information that Nita has assimilated for everyone here. I’m looking forward to her next book on COLOR. 14. What seminars/workshops/lectures did you attend?I go to Mississippi Art Colony retreats twice a year unless I’m on a long trip. It is always an inspirational trip for me……….meeting up with all the artists I know there and meeting the new visiting artist each time.I especially have to thank my colony friend, Christy Liffmann, for introducing me to encaustic this year at her studio in Baton Rouge. And to Karen Jacobs for making me more aware of this medium way back when. 15. What organizations were you involved with?Longview Museum of Fine Arts, National Association of Women Artists, Women Artists of the West, Mississippi Art Colony, International Encaustic Artists. 16. What grants/honors/awards did you receive?The Women Artists of the West invited me to show with them and 9 other outside artists at their annual show in Chicago. 17. What articles were written about your work?Many advertisements and articles were included in National magazines about the WAOW show. An AZ magazine also had an article from an interview with me for my August solo show at the Joyous Lake Gallery. 18. What submissions did you make?I made inquiries and submissions to at least 10 galleries this year. 19. Where did you save a wad of money?Let’s don’t go there, please….but I’m not in the red at least. 20. What was the single best thing that happened to your art career in 2007?FOUR NEW GALLERIES and an almost empty paintings storage closet…………boy do I have my work cut out for me in 2008. AND my long time gallery, Brunner Gallery, Covington and Baton Rouge, LA, and I are going to set up a show in early 2009.. I’m also fortunate to have a new Dallas, TX gallery, Artizen Fine Arts. 2007 has indeed been a good year for my painting career. More later for 2008 expectations and/or goals.